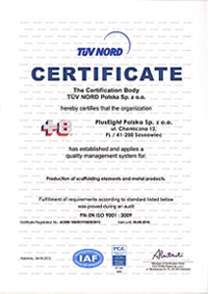 +8 is produced in Poland and Sweden. 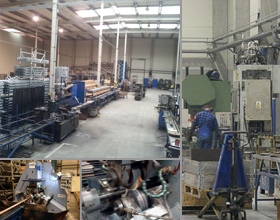 It is necessary to have control of all parts of the production to guarantee our customers the high quality they expect. To achieve this we have extensive machinery but above all knowledgeable, experienced and safety conscious employees. Here are a few samples from the production. We produce the threaded part in our thread forming machine from high-tensile steel tube that becomes even stronger in the process. The high-tensile steel base plate we produce in one of our presses. Both robotic and manual welding is used to weld +8 components. Our welders are weld certified professionals. 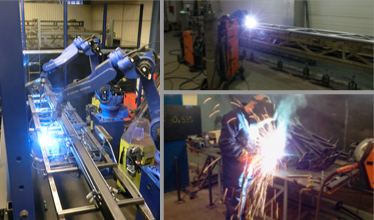 No matter whether it is manual or robotic welding it is done in accordance with ISO 9001 QMS. We produce our platforms from high-tensile extruded aluminium. Some parts are punched in our press line. All parts are cut into different sub-parts in our automatic cutting machines, tumbled and in some cases CNC-worked before assembling.